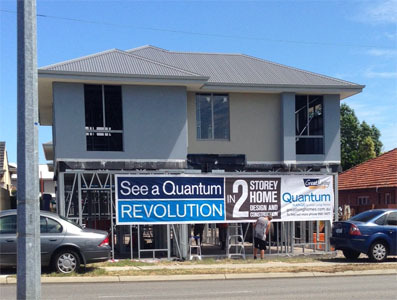 Our new innovative building technology allows faster and less expensive completion times than ever before on two storey homes. Why? – We build the upper floor on the ground, jack it up and build under it. This means no scaffold, cranes and hoists, saving you the cost and time of using these materials. It also means no working at heights, making it a safer and much more accessible work site. How long does it take? – No one can tell you exactly, but what we can tell you for sure, is that it is faster to build this way than the conventional ground floor first. This means we can build with a concrete slab and lift up the top floor, which other systems such as factory built PODs can’t do! A Concrete Upper floor is far superior to timber upper floors, quiet, thermally efficient, solid feel and structurally stronger, won’t creak or move. 2 storey building has changed forever! 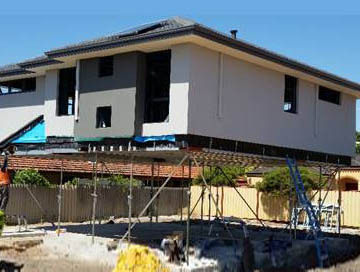 We can build you a two storey home faster than ever, with a method that’s totally unique to the construction industry, safer, at lower cost and lower ongoing maintenance.